What is life really like for millennials? What do they think about their uncertain futures? Meena Kandasamy writes about Ravali Medari, a Dalit student activist. ‘People don’t like Dalits talking about the truth,’ says Ravali Medari, a student activist at the University of Hyderabad. Ravali Medari is different now. She was a quiet teenager and her elder brother had to fill out her university application form for her. Now she is a strong student activist. ‘I am very different from when I first came here three years ago,’ she says. University in India is hard work, and the studying, competition, and stress are too much for many students. 22-year-old Ravali has done all of these and at the same time started a revolution. 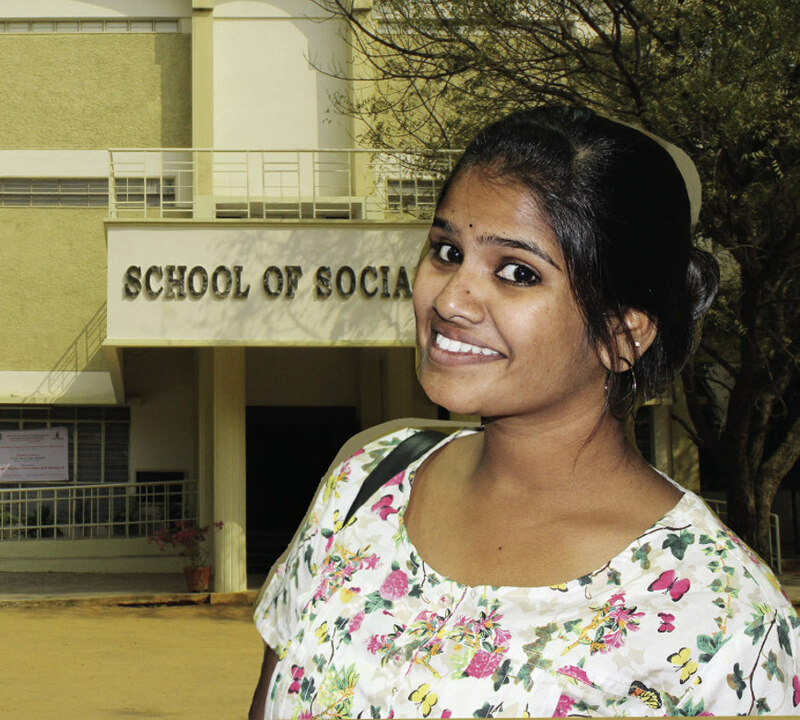 She is studying for a Master’s degree in anthropology the University of Hyderabad, which after the past two years is now the centre of a student revolt. The university was in the national headlines for many months after the death of Rohith Vemula, a young Dalit PhD student. He took his own life on 17 January 2016. Rohith’s suicide started a reaction all over India about freedom of expression, state repression, and caste inequality. He and four other Dalit students spoke against rightwing Hindu extremism. The university suspended the students, took away their accommodation, and stopped Vemula’s monthly money. Dalits are the lowest in the Indian caste system and find discrimination in all areas of life. The university’s action with Rohith and his friends was more caste discrimination. It shamed them publicly and it planned to stop them. Ravali was at the centre of the protests which shut the university with police and armed paramilitaries on the big green campus. She is a star singer and actor in a progressive theatre group, and her strong speeches made people listen. At first she was vice-president of the Marxist group Students’ Federation of India at the university. But the caste problem led her to join the Ambedkar Students Association to which Rohith Vemula belonged. It was named after the revolutionary Dalit leader, Ambedkar, from the time of Indian independence. A picture of Dr Ambedkar is the only thing on the walls of her student room, I ask Ravali how she is an activist and a student at the same time. Like most students at university in India, she has a lot of work. I waited for over two weeks for her to have time to see me for this interview. ‘All this politics, listening to debates, helps me with my studies, helps me understand the world around me,’ she says. Ravali knows the problems for the Dalits in rural India. Her family live in a small town called Manthani in Karimnagar district. It is about six hours by car from Hyderabad. Ravali says that there are thousands of children there but only three high schools that teach in English. She had to travel outside town each day to go to an English-speaking school. English in a fast growing, globalizing India is important, but often your caste or your class decide if you will go to an English-language school. Meena Kandasamy is a poet from Chennai, and an activist and writer in London. Her latest novel is When I Hit You: Or, The Portrait of the Writer As A Young Wife (Atlantic Books, UK). This page was last edited on 13 January 2018, at 10:33.